Our winter practice season begins Wed, Oct 17 and will continue until the Wednesday before the march to Concord on April 19. Starting Nov 7, 2018 our venue has been moved to the Ephraim Curtis Middle School at 22 Pratt's Mill Road. We will be using the chorus and band rooms. Park in the bus lot on the Pratts Mill side of the school and enter the building via the doors facing that lot. 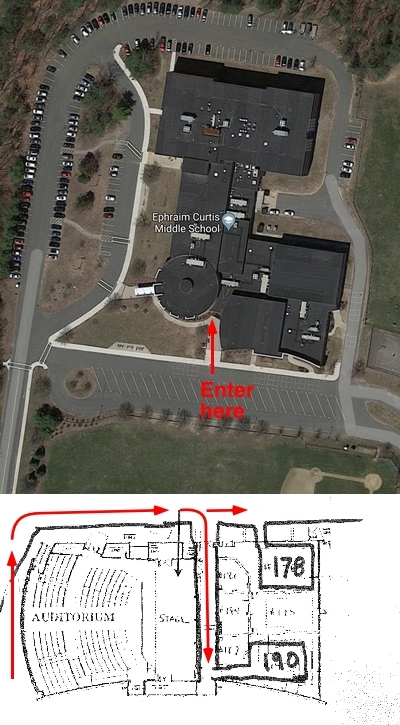 If the lot is full, you may park in the main parking area near the main school entrance, but you will need to walk around to the entrance doors facing the bus lot to get in. When you enter the school, the theater will be on your right, and the cafeteria with be in front of you. Take a right and walk down the hallway past the theater (toward the gym). Just after the theater is a hallway to the right where the band room is (Room 190). The Chorus room is right there at that intersection (Room 178). Summer practice is at the Wayside Inn in colonial attire and includes a trip through the Inn to deafen the diners and knock over some chairs. We meet weekly from after the march on April 19 to the annual Faire and Muster the last Saturday in September. Sectional practice is in the parking lot behind the Inn and Companie practice is held on the front lawn. We generally retire within to the Old Bar for conversation and a few more tunes after practice. Below is a list of the music we will be working on each week with links to the sheet music. Note that "Combined" files include both fife and drum parts. Drum parts are available in either Up/Down or Right/Left notations. Some sheet music is being reformatted for posting. We hope to have these pieces up Real Soon Now. Please remember that memorization is to be done in your individual home practice so you are prepared to work on execution and expression at Companie practice. The drum line review schedule is in pdf format.